At work sometimes there are sweets at the top of the stairs. I am aware that I eat (far) too many sweets as it is so I resist almost all of them. In this case I spotted something that I hadn't seen for a good while - Eclairs with different flavour centres. Now I know Cadbury's have flirted with this over the years as I've had some, and I used to get a white choc centred one from a pick'n'mix place that was by my grandparents old house, but I haven't had these as an adult so I figured I'd have a try. First up was the baseline - chocolate eclair. Decent toffee, maybe a little sweet to cover up for the cheapness, but unsweet choc to balance it so pretty nice and edible. 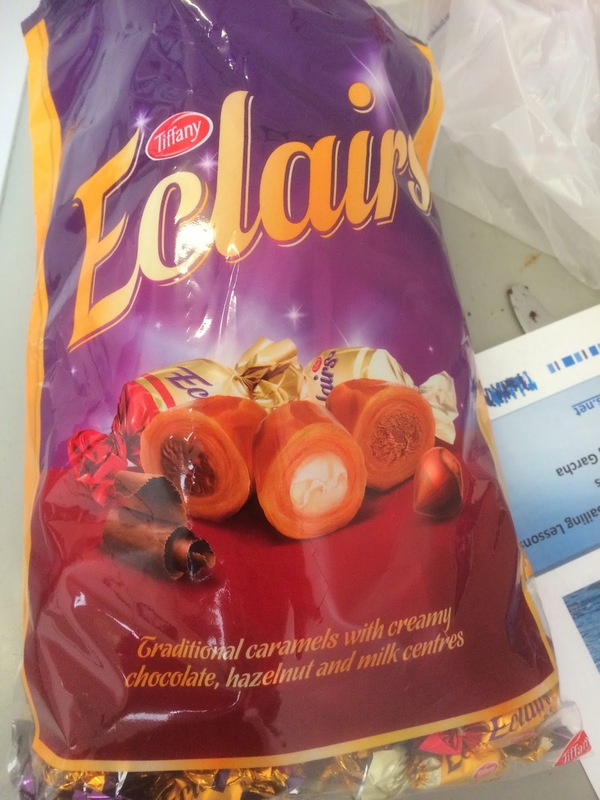 We've been spoilt by Cadbury's Eclairs over the years, so anything that tastes off brand is very noticeable, but this was a decent alternative and boded well for the remaining flavours. Next up I tried the milk flavour. I had to double check the bag for this one as I'd presumed it was white chocolate, but it is indeed just a milky fondant substance. It wasn't unpleasant but then it wasn't really strong enough to fight off the toffee. It was a nice sweet, but just a toffee with a squishy centre. The Hazelnut one was last up and as I'd hoped the most interesting of the bunch. It was again more toffee with a hint of, but the darker flavour of the Nutella-like substance helped tip it over the edge. I'd have gone back for a second one of these, but they'd all been eaten or squirrelled away by that time. It got me wondering whether there are official Nutella Eclairs and while there kind of are (in the pastry sense) I think the sweets would work too.